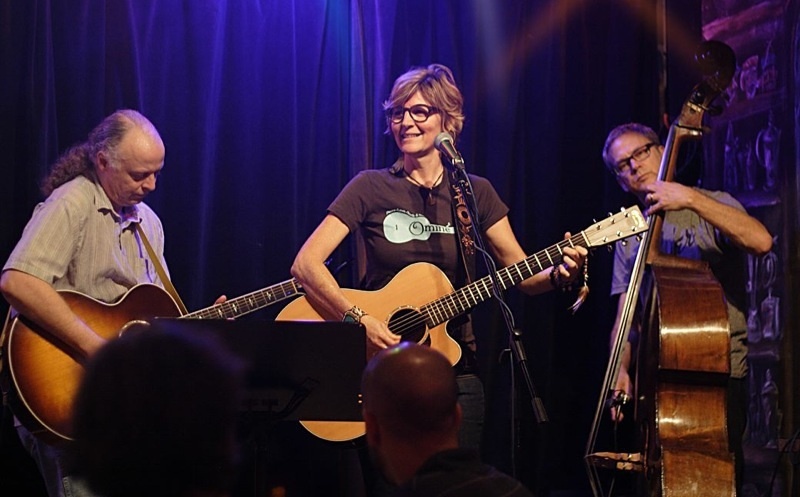 Recently, I had the chance to meet a fantastic “under-the-radar” musician and her band through her performances at one of my favorite local wine bars in Coconut Grove, Florida. Ominé is a remarkable musician; she often writes songs in the mornings that she performs on stage that same evening. Not only does she have her own album out (which you can buy on iTunes by clicking here), but she also plays the most beautiful covers of some of the best classic rock songs. Ominé has built up quite a following here in the Miami area, and she was also asked to play out at the Sundance Film Festival in Park City, Utah earlier this year. Surely, she will play out West for the rich & famous at Sundance again, and soon, she will certainly make a name for herself in the music industry. Just this week, I had the chance to interview Ominé about her music, her history, and her wine. If you don’t know about her yet, you can say that you heard about her first on History & Wine. H&W: Ominé, first of all, Congratulations on being chosen to perform at Sundance! As an independent artist, how did that process of selection go for you? OE: Thank you! Going to Sundance Film Festival was a wonderful trip, and a great connection for future shows at the festival for 2015. Being an independent artist in this era is exciting, always learning new tools for exposing our music to the world. It’s a great time in our history of music to be able to have the control of our careers and exposure. H&W: You perform weekly at the wine bar, Vinos in the Grove. How did you get involved with playing music at Vinos? OE: I love Vinos in the Grove. I love performing there; it’s my favorite gig. It’s as close to hanging out in your living room drinking lovely wine sitting back and hearing a live band perform a private show for you. How I came to Vinos was through a referral from a fellow friend/musician, Adrian Gonzalez – who performs at Vinos on Wednesday nights. Vinos was looking for a musician to perform on Sundays, and Adrian had referred me. It has been a perfect fit since I started last May 2013. H&W: What brought you down to a city like Miami, where sometimes it is more difficult to break into the music world if you don’t fit into certain genres? OE: My family moved to Coconut Grove in 1976 from Lake Tahoe. I have never thought of breaking into any scene; I have always had a guitar in my hand since the age of 7. I knew early on that playing music was magical and brought great joy and happiness to people. I have always remained true to my style and never compromised my sound or songwriting to fit into any genre. Over time it has built my fan base and originality. H&W: What is your favorite part about performing; whether on a small scale at Vinos, or perhaps at a larger venue? OE: My favorite part of performing is watching the smiles on people’s faces. They start to relax and let go, and for a moment they are somewhere else, forgetting their stress and worry and enjoying the moment of music. It’s healing and powerful to hear the audience sing along, loud and proud. H&W: Are there any musicians, living or dead, who you admire the most? OE: That’s a tough question to answer, but really I admire anyone who follows his/her heart’s dream and passion. Everyone inspires me to grow. My father and my mother both shared the gift of music with me in their own way. Both were very talented. My fondest childhood memories are of listening to them play music. H&W: Tell us a little bit about your fascinating family history in Virginia (my favorite state). OE: Yes, well my mother and her ancestors settled in Virginia in 1680, from Scotland and France. I was the last child to be born in the family house. The house was over 100 years old! My grandmother was also born in the same house. So much history… I will have to share in another interview… 😉 Maybe I’ll write a short book about it. H&W: You mentioned that your father was a musician. What influence, if any, did he have on your own career as a musician? OE: Yes, my father was Allen Eager, a tenor sax jazz player back in the 40’s and 50’s. He was part of a group of young jazz musicians that changed the sound /style of jazz from Big Band to Bebop. The Four Brothers: Miles Davis, Charlie Parker, Zoot Sims, Stan Getz, the list goes on. But yes, my father shared very valuable lessons with me about music. As a child, I would sit in the room with him while he practiced his scales. He trained my ear to hear and feel music before learning to play and read music. To me, this was the most profound gift to share with me. Then, through the years, he would ask me to play for him and he would sit back and listen with a great big smile on his face. He taught me that in order to be connected with my instrument, I would have to practice everyday, and to this day, I practice everyday. Less is more, and always keep in mind the integrity of the song or music that is being created. H&W: Where do you find most of your inspiration when writing music? OE: At first when writing a song it’s for me. I sing to myself to remind me of where I want to be and who I want to be in this lifetime. I share very personal thoughts and feelings. I just put it out there. It’s like a virtual journal; like a mantra. I find great comfort when I feel lonely or sad or happy to sing about my feelings. Then to know that someone else out there might relate and it will help him or her find comfort. Well, that is the best part of songwriting–the connection with other beings. H&W: I have to ask, what is your favorite wine (as a musician who plays regularly at a wine bar)? OE: Wow, I love wine, and I have so many favorites. The one that sticks out the most was a Shiraz from Australia named “Vicar, Vintage 2008”. A beautiful wine, full, but light and well balanced with a hint of pepper. Unfortunately, it is no longer available. I drank the last 6 bottles that Vinos carried. My second favorite would be a Pinot Noir from Truchard. H&W: Final question: What is your advice to new (local/independent) musicians who are hoping to make a break into the industry? H&W: Thank you, Ominé! I wish you much success! ← What’s So Romantic about the Death of a Saint?